Coat of Arms of Cerdanya. The County of Cerdanya (Catalan: Comtat de Cerdanya, IPA: [kumˈtad də səɾˈðaɲə]; Latin: Comitatus Ceritaniae; Spanish: Condado de Cerdaña, French: Comté de Cerdagne) was one of the Catalan counties formed in the last decades of the 8th century by the Franks in the Marca Hispanica. 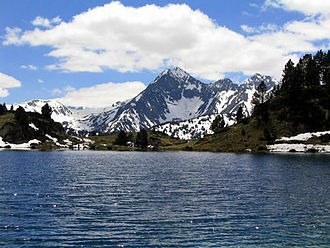 The original Cerdanya consisted of the valley of the upper Segre. Today Cerdanya is a Catalan comarca. 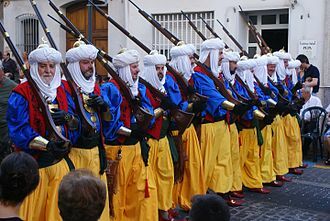 The region had been conquered by the Moors in the early 8th century. 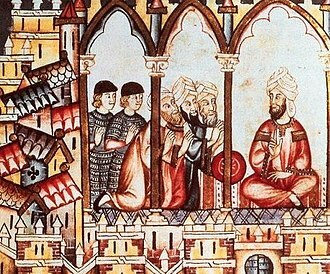 In 731, the Moorish governor of Cerdanya allied himself with Odo the Great by marrying his daughter, at Odo's insistence, in order to secure his southern frontier from further Muslim expansion. Cerdanya was at this time predominantly Basque, and Odo had a pro-Basque policy in the face of Charles Martel and the Franks. Moorish rule was soon purely nominal; the Cerdanya was conquered by Charlemagne shortly after the surrender of Girona in 785. The first Count of Cerdanya that we know of by name was Borrell I (798), who was subject to the Count of Toulouse. At this date, Cerdanya was united in government under one count with County of Besalú and Urgell; it was part of the Kingdom of Aquitaine after 817. Cerdanya and Urgell remained united until 897 and both were under the influence and often control of the Count of Aragon. In 842, the Emirate of Córdoba invaded Cerdanya in an attempt to regain the Pyrenees, but they were repulsed by Count Sunifred. 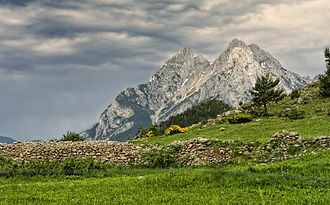 In the 9th century, Cerdanya was the centre of a region wherein the aprisio form of landholding was common. In 835, a charter of Louis the Pious even forbid the church of the region to grant lands in beneficium, that is, as benefices or in feudal tenure. After the death of Louis the Stammerer (879), Aquitaine and West Francia in general experienced a period of instability during which the outlying regions, such as Catalonia, became de facto independent of central royal authority. During this period as well, the office of count became de facto hereditary. The 10th century saw repeated divisions and reunions of the familial lands of the Bellonids and Cerdanya was repeatedly attached to and detached from its neighbouring regions and counties. The counts of Cerdanya frequently used the title marchio, meaning margrave, during this period. This was an indication of their status as frontier lords and of the breakdown in royal authority, which permitted regional magnates to assume whatever titles they wished without incurring royal disfavour. As another result of its frontier location and the lack of royal control exercised over it, Cerdanya was dotted with numerous castles during this period, when the Muslim threat was still strong. In 897, Wilfred the Hairy died having divided his vast Catalan patrimony (technically just a plurality of public offices) between his four sons. Cerdanya, Conflent, and Berga went to Miro. The Fenouillèdes and Capcir were also annexed to Cerdanya at this time. From 913 to 920, Miro also held Besalú, but on his death in 927, his territories were divided between his four sons. The eldest, Sunifred, received Cerdanya and a certain primacy over his brothers. In the last half of the 10th century, the counties of Miro were reunited (984) under one ruler: Oliba Cabreta. His county comprised Besalú, the Fenouillèdes, Capcir, the Baridà, the valley of Orillas, that of Lillet, the Berguedà, the Ripollés, the Vallespir, the upper plain of Roussillon from Illa de Tet to Sant Esteve del Monasterio, Conflent, the Donasà, and Peyrepertuse. Oliba's counties and the counties of Borrell II, Count of Barcelona, formed the two main divisions of Catalonia during the latter half of the 10th century. Oliba brought Cerdanya to its zenith. He expanded his lordship to the north into the County of Carcassonne and to the west into the Counties of Roussillon and Empúries. He extended his authority over the churches of Sant Joan de les Abadesses and Lagrasse and usurped the de facto supremacy in Catalonia from Borrell II of Barcelona. In 988, Oliba Cabreta retired to the monastery of Montecassino and divided his lands between his three sons, the second-born, Wilfred, receiving Cerdanya and Conflent. In 1002, Berga was annexed to Cerdanya. It is clear, however, from evidence dating from between 987 and 1031, that the Carolingian court system and Visigothic law were still in effect in Cerdanya. The count presided over judicial tribunals with the assistance of the judices (judges) and boni homines (good men) of the county. For a record of Cerdanya's feudal status under the Crown of Aragon (c.1205), see Liber feudorum Ceritaniae. During the 11th century, Cerdanya became increasingly feudalised and drawn into the orb of Toulouse and Foix. 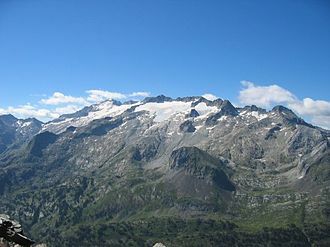 The counts of Toulouse desired to control the pass of Pimorent (French: Puymorens) in Cerdanya, and those of Foix desired some control of the frontier with Moorish Lérida. The counts of Cerdanya, for their part, were interested in furthering their control of the church in the Midi and Catalonia; they had already controlled the important monasteries of Sant Miquel de Cuixà and Ripoll since the early 10th century. In 1016, they purchased the right to the archbishopric of Narbonne for 100,000 solidi for their relative Guifred and, not long after, that to the bishopric of Urgell as well. The famous Abbot Oliva was a member of the ruling dynasty of Cerdanya. 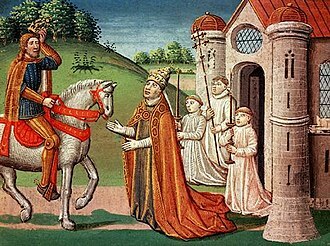 When Count Raymond Wilfred plundered the Sant Miquel de Cuixà and entered into a feud with the Bishop of Elne, it gave the nobles opportunity to grant their services to whoever offered them the most advantage at the moment. In this period of political confusion, the viscount Bernard Sunifred rebelled. His lands were clustered in the north of Cerdanya, in the Segre valley and Conflent with their centre at Merencs. He put his lands under the nominal suzerainty of the count of Toulouse and tried to draw them away from Cerdanya. 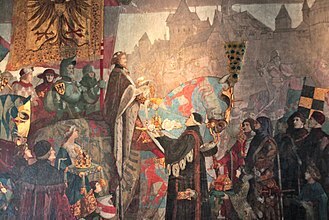 Bernard was forced to make peace with Raymond in 1047 and his allodial lands were handed over, though he was compensated with more fiefdoms from the count. 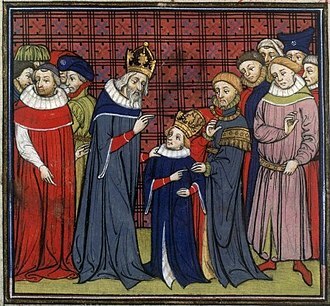 Bernard rebelled a second time and was forced to make peace again in 1061. The important pass of Pimorent, which, now that Cerdanya was no longer a marcher territory, lay at the centre of its existence, remained in the hands of the Count Raymond and neither of Bernard's allies of Toulouse or Foix. The viscounts of Cerdanya and the others regions, like Conflent and Fenouillèdes, were the main antagonists of the comital power in Cerdanya throughout the 11th century. Briefly, William Raymond had to fight a war (successfully) with Giselbert II of Roussillon over the possession of the monastery of Cuixà, which Cerdanya had controlled throughout the 10th century, but in the main, the viscounts were the greatest military detriment to the counts of Cerdanya. Between 1088 and 1092, William founded Vilafranca de Conflent. William's successor, William Jordan, joined the First Crusade, and in his absence, the counts' authority was weakened still further. In 1118, Cerdanya was sold to Barcelona and only occasionally bestowed thereafter as appanage for younger sons. The failure of the county of Cerdanya to establish lasting supremacy over Catalonia lies in the penchant of its counts to divide their patrimony between all of their sons — and the rights of inheritance of brothers — and the gathering strength of the nobility following the decline of Cerdanya's military importance. In 1058, when Count Raymond accepted the pay of Raymond Berengar I of Barcelona to be his ally in the fight against the Moors, the fate of Cerdanya to be in the control of Barcelona was sealed. In the next centuries, Cerdanya was part of the Principality of Catalonia. The title then passed finally and permanently to the Crown of Aragon. ^ a b Lewis, 22 and n6. ^ Lewis, 44, refers to Urgell-Cerdanya-Besalú — sometimes Urgell-Cerdanya-Confluent — as a "complex". Ripoll is the capital of the comarca of Ripollès, in the province of Girona, Spain. It is located on confluence of the Ter River and its tributary Freser, the population was 11,057 in 2009. The first traces of humans inhabiting the area date from the Bronze Age and this area was used by peoples from the Atlantic culture to store bronze weapons and as a passway from the Catalan Central Depression to the Pyrenees. The area has tombs from the late Roman occupation age and it has a famous Benedictine monastery built in the Romanesque style, Santa Maria de Ripoll, founded by the count Wilfred the Hairy in 879. The count used it as a centre to repopulate the region after conquering it. In the High Middle Ages, its castle, the Castle of Saguardia, located in the county of Les Llosses was ruled by the Saguàrdia family, of which Ponç de la Guàrdia was a famous troubadour. An abundance of coal and iron ore, coupled with the water supply of the rivers Ter and Freser. The furnaces of Ripoll were a source of nails for the peninsula. Lleida is a city in the west of Catalonia, Spain. It is the city of the province of Lleida. Geographically, it is located in the Catalan Central Depression, the metro area has about 250,000 inhabitants. It is the city of the Segrià comarca, as well as the largest city in the province. It had 137,387 inhabitants as of 2010, including the municipalities of Raimat. Lleida is one of the oldest towns in Catalonia, with recorded settlements dating back to the Bronze Age period, until the Roman conquest of the Iberian Peninsula, the area served as a settlement for an Iberian people, the Ilergetes. The town became a municipality, named Ilerda, under the reign of Augustus and it was reconquered in 1149, after being ruled by the Moors for many centuries, who had conquered the town in the 8th century. In 1297, the University of Lleida was founded, becoming the third oldest in the whole of Spain, during the following centuries, the town was damaged by several wars such as the Reapers War in the 17th century and the Spanish Civil War in the 20th century. Since then, the city has been in a constant urban, commercial, in ancient times the city, named Iltrida and Ilerda, was the chief city of the Ilergetes, an Iberian tribe. Indíbil, king of the Ilergetes, and Mandoni, king of the Ausetanes, under the Romans, the city was incorporated into the Roman province of Hispania Tarraconensis, and was a place of considerable importance, historically as well as geographically. Its situation induced the legates of Pompey in Spain to make it the key of their defense against Caesar and it ended by the capitulation of Afranius and Petreius, who were conquered as much by Caesars generosity as by his strategy. 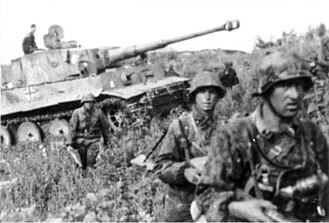 In consequence of the battle, the Latin phrase Ilerdam videas is said to have used by people who wanted to cast bad luck on someone else. Under the Roman empire, Ilerda was a flourishing city. It had a stone bridge over the Sicoris. In the time of Ausonius the city had fallen into decay and it was part of Visigothic and Muslim Hispania until it was conquered from the Moors by Count Ramon Berenguer IV of Barcelona in 1149. Sant Joan de les Abadesses is a town and municipality located in the south-east of the comarca of Ripollès, in the province of Girona, Spain. The town is located along the part of the River Ter, in the valley of the same name, and enclosed by the Serra Cavallera to the north. It has an inland, continental climate, with abundant precipitation, most of the economy of Sant Joan de les Abadesses is centered on industry and manufacturing. However, there have recently been increases in tourism to the town. Rural areas of the municipality are occupied by farms, usually raising cows. Human settlement in the valley around Sant Joan de les Abadesses dates to prehistoric times and it seems that the area was not very much Romanized, despite the fact that a branch of the Via Augusta went up the valley to the Coll dAres. The origins of the present town lie in the founding of the Monastery of Sant Joan de les Abadesses by Wilfred the Hairy in 887 and this was one of the first nunneries founded in Catalonia, and its first abbess was Emma of Barcelona, daughter of Wilfred. The Benedictine community grew in wealth and importance throughout the 10th century, however, in 1017, the nuns, accused of violating the rules by which they were supposed to be living, were expelled in a bull by Pope Benedict VIII. 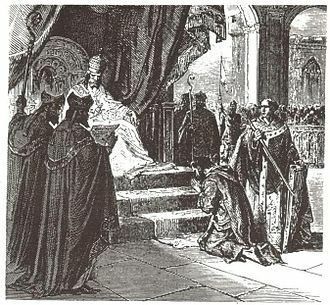 This expulsion initiated a period of instability lasted until the re-establishment of canons of the order of Saint Augustine in the 12th century. The new Augustinian monks largely rebuilt the monastery, including new churches for the monastery itself, new cultural importance and splendor was brought to the monastery in this period, as evidenced by its extensive archive of troubadour songs from this era. Around the monastery, the town of Sant Joan was founded, the laypeople lived around the Church of Sant Pol, in the neighborhood today known as El Raval. But the towns growing population necessitated the construction of a town on land that had been known as El Vinyal. This part of the town was home to numerous medieval guilds, as time passed, power in the town shifted from religious to secular. 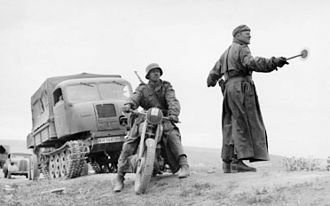 Monte Cassino is a rocky hill about 130 kilometres southeast of Rome, Italy,2 kilometres to the west of the town of Cassino and 520 m altitude. Site of the Roman town of Casinum, it is best known for its historic abbey, St. Benedict of Nursia established his first monastery, the source of the Benedictine Order, here around 529. The hilltop sanctuary was the site of the Battle of Monte Cassino in 1944, the site has been visited many times by Popes and other senior clergy, including Pope Benedict XVI in May 2009. 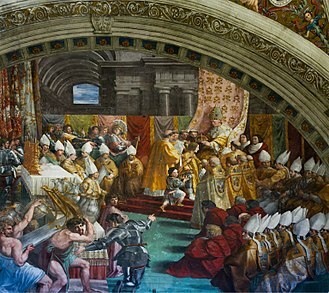 Since the reforms of the Second Vatican Council the monastery is one of the few remaining territorial abbeys within the Catholic Church, on 23 October 2014, Pope Francis applied the norms of the motu proprio Ecclesia Catholica to the Abbey. This act removed from its jurisdiction all 53 parishes and reduced its territory to the Abbey itself - while retaining its status as a Territorial Abbey. The former territory of the Abbey, except the land on which the Abbey Church and monastery sit, was transferred to the local diocese of Sora-Cassino-Aquino-Pontecorvo. The history of Monte Cassino is linked to the town of Cassino which was first settled in the fifth century B. C. by the Volsci people who held much of central. It was the Volsci who first built a citadel on the summit of Monte Cassino, the Volsci in the area were defeated by the Romans in 312 B. C. The Romans renamed the settlement Casinum and build a temple to Apollo at the citadel, modern excavations have found no remains of the temple, but ruins of an amphitheatre, a theatre, and a mausoleum indicate the lasting presence the Romans had there. 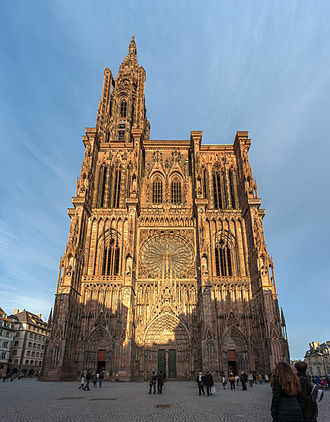 Generations after the Roman Empire adopted Christianity the town became the seat of a bishopric in the fifth century A. D, lacking strong defences the area was subject to barbarian attack and became abandoned and neglected with only a few struggling inhabitants holding out. According to Gregory the Greats biography of Benedict, Life of Saint Benedict of Nursia, the monastery was constructed on a pagan site. The biography records that the area was still pagan at the time and Benedicts first act was to smash the sculpture of Apollo. He reused the temple, dedicating it to Saint Martin, archaeologist Neil Christie notes that it was common in such hagiographies for the protagonist to encounter areas of strong paganism. Once established at Monte Cassino, Benedict never left and he wrote the Benedictine Rule that became the founding principle for Western monasticism, received a visit from Totila, king of the Ostrogoths, and died there. The Rule of St. Benedict mandated the moral obligations to care for the sick, so in Monte Cassino St. Benedict founded a hospital that is considered today to have been the first hospital in Europe of the new era. There Benedictine monks took care of the sick and wounded according to the Benedict’s Rule, the monastic routine called for hard work. The care of the sick was such an important duty that those caring for them were enjoined to act as if they served Christ directly, Benedict founded twelve communities for monks at nearby Subiaco, where hospitals were settled too as adjuncts to the monasteries in order to provide charity. In its broader meaning, Marca Hispanica sometimes refers to a group of early Iberian and trans-Pyrenean lordships or counts coming under Frankish rule. As time passed, these lordships merged or gained independence from Frankish imperial rule, the area broadly corresponds to eastern regions between the Pyrenees and the Ebro River. The local population of the March was diverse, the Pyrenean valleys started to switch loyalties after 785 with the construction and garrisoning by counts loyal to the Carolingians of new outposts and fortresses on bordering areas. The territory changed with the fortunes of the Empires and the ambitions of those, whether the Counts or Walis. Eventually the rulers and people of the March became autonomous and claimed independence, out of the welter of counties in the region emerged the principality Catalonia divided into a myriad of counties with the county of Barcelona as their main power centre. Counties that at times formed part of the March included, Urgell, Perelada, Empúries, Besalú, Barcelona, Girona and, Roussillon, Vallespir. The nominal boundaries of Gothia and the Hispanic Marches vary in time, the Muslim invasions reached the Pyrenees in the Iberian Peninsula. In 719 the forces of Al-Samh ibn Malik surged up the east coast, overwhelming the remaining Visigoth province of Septimania, control was secured by offering the local population generous terms, inter-marriage between ruling families or treaties. Further expansion was halted by defeat in the Battle of Toulouse, wālis were installed in Girona and Barcelona. The Muslim forces however continued to raid their Gallic neighbours to the north, the peace treaty was sealed with the marriage of the Duke’s daughter to Munuza. However, Munuza was defeated by a Umayyad military expedition and another period of Muslim expansion commenced, Aquitaine pledged formal allegiance to the Frankish leaders several times, but remained actually independent. 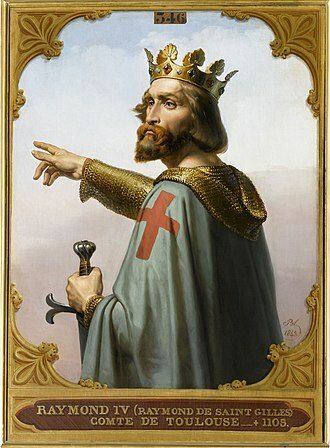 In 737 Charles led an expedition to the Lower Rhone and Septimania, possibly seeing that the Umayyad thrust was threatening his grip on Burgundy, both Aquitaine and Septimania were still out of central Frankish control after Charless death, but Pepin the Short was determined to subdue southern Gaul. The medieval remains of Besalú. The bridge dates to the twelfth century. The aft exterior of the nave of the church of San Pere, dedicated in 1003. It was the cathedral of the short-lived diocese of Besalú.